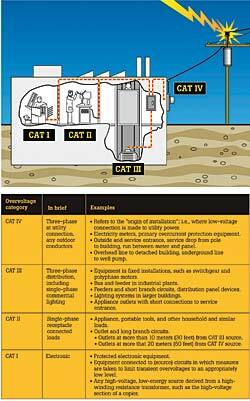 Most commercial and industrial electricians work in a CAT III or CAT IV environment--sometimes without knowing it. And that can lead to real danger. MEASURING live voltages and current in today's high-energy environments can result in a severe hazard to equipment and users if proper precautions are not applied. Given the risk of transients, surges, and old-fashioned human error, it always pays to follow safe work practices and use test instruments rated for the voltage or current you're measuring. Whenever possible, work on de-energized circuits and follow proper lockout/tagout procedures. If you have to work on live circuits, following the steps below will improve your measurement practices and help to reduce any hazard. Assess the environment before taking the measurement. Do not work alone in hazardous areas. Wear the appropriate personal protective equipment as determined by NFPA 70E. Make sure your test instrument is rated for the measurement environment. Be familiar with and know how to use your equipment prior to any hazardous measurement. Make sure that your meter, and especially your test leads and probes, are in proper working order. Measure at the lowest energy point. Hang the test instrument or place it on a shelf in front of you, if available. This allows you to concentrate on where your hands are placed and keep your eyes on where you are probing. For single phase, connect neutral first, hot second. Use the three-point test method discussed below. Use test probes with a minimum amount of exposed metal, such as .12-inch (4-mm) metal tip probes. Before you open an equipment cabinet, look over your work environment. How do you plan to use your meter? Where will you mount it? Do you have clear access to the equipment in question? Have you been trained on or are you knowledgeable in the use of your meter? Are environmental hazards present, such as tight work spaces or a damp work area? Do you have enough light and ventilation? Also, make sure you have a helper knowledgeable in electrical safety or let someone else know where you're working. It's never good practice to work alone on high-energy circuits.Avoid working in dark areas. If you choose to work in a dark area, turn on the test tool's backlight to brighten the display for easier viewing. And, if you're working in a deep or recessed panel, use a test probe extender and probe light to illuminate the area to be probed. Be sure you can clearly view the point of measurement. The probe extender facilitates measurement by keeping your hands farther away from the inside of the panel, reducing potential danger. When an arc flash occurs, PPE is the only thing that can defend you from possible serious injury or death. When measuring systems of 1,000 volts or less, including 480V and 600V three-phase circuits, follow the detailed PPE guidelines set forth in NFPA 70E and NEC article 110.16. These guidelines include, among other considerations, eye and hearing protection, insulated hand tools, insulated gloves, and fire-resistant clothing. In the four-category rating system, the closer you are to the power source, the higher the category--and the greater the danger. CAT III covers distribution level wiring, including 480- or 600-volt circuits such as three-phase bus and feeder circuits, motor control centers, load centers, and distribution panels. Given the trend toward using higher voltage levels in modern buildings, most commercial and industrial electricians work in a CAT III or CAT IV environment--sometimes without even knowing it. And that can lead to real danger. Make sure your test instruments are rated to a minimum of CAT III 600V. Most digital multimeters (DMMs) display these ratings near the voltage/current input terminals. If your DMM and your leads don't have the appropriate ratings, don't make the measurements with them. If you have to make these measurements, upgrade and purchase instruments rated for that environment. Using an older instrument (manufactured prior to 1996) or a new instrument without the proper voltage and category rating will put you and your employer at risk. Before starting work, examine your test instrument and your test leads and probes for signs of excessive wear and tear or broken parts. Check your test leads for continuity. Replace worn or broken items before proceeding. It is a good practice to measure voltage at the point of the lowest available energy. For example, if you are measuring voltage on breaker panels, identify the lowest-rated breaker available and make your measurement there. This way, you have more protection between yourself and the potential hazard. Don't hold on to your test instrument during your measurement. Use the instrument's bail stand (if it has one), and set it either on a bench nearby or on the floor. Better yet, use the instrument's magnetic hanger to hang the unit on the edge of the panel at eye level. Don't try to watch the meter while you make your measurement; always keep your eyes on your test probes. When taking single-phase measurements, always connect the neutral lead first, the hot lead second. After taking your reading, disconnect the hot lead first, the grounded lead second. 1) Test a similar known live circuit first. 2) Test the "circuit to be tested." 3) Re-test the first known live circuit. This process verifies your test instrument is working properly, which is an important part of your personal safety. When making measurements in or around high-energy three-phase distribution panels, use test probes with a minimum amount of exposed metal at the probe tips, such as .12-inch (4-mm) metal tip probes. This reduces the risk of an accidental arc flash from probe tips being inadvertently shorted together between phases. Keep one hand in your pocket or out of the panel and the measurement circuit. You don't want to offer a closed circuit. Whenever possible, use a properly rated alligator clip to attach the black test lead to the circuit under test. This gives you a free hand to probe with the red test probe. Test instruments in use offer a variety of options, functions, and accessories that can make electrical measurements easier and safer than ever before. Cosmetic improvements, such as larger displays and bright backlights, enhance readability of the test instrument displays in poor lighting conditions. Displays are easier to read than ever before. Test leads, probes, and clips have been improved; now they must have the appropriate category rating, as well. In addition, probes with reduced metal at the probe tip are available, which substantially reduces the chance for an arc blast. Probe extenders allow users to keep their hands outside of the panel, allowing for a safer measurement. Using alligator clips for measurements keeps your hands out of the panel for extended measurements. Magnetic hanging accessories are available for many meters, allowing a user to hang the meter from a steel surface. This allows for placement of the meter at eye level for easier viewing and also frees up one hand so the user can better concentrate on the measurement. Product improvements such as category-rated test instruments make the product much safer than test instruments made prior to 1996, especially when used in today's high-energy environment. Test instruments as discussed in this article must be rated at a minimum of CAT III 600V. Many test instruments have similar functionality. All can measure ac and dc volts, ohms, and continuity but have advanced functionality, such as min-max recording, logging, frequency, capacitance, and display hold. Min-max recording and logging allow for making measurements over time. By using alligator clips at the measurement points, the user keeps hands out of harm's way and can be doing other duties while the meter does the work. Frequency is handy for line frequency measurements or generator work. In some cases, meters can display the ac voltage and the frequency simultaneously. Capacitance is useful for checking motor start caps or power supply capacitors in motor controls when necessary. Display hold is also handy so the user can concentrate on the measurement points, then simply press the display hold button and get the reading after the measurement is over. Test instruments available today, when combined with safe work practices, offer troubleshooters many enhancements that make the measurement environment and the measurements themselves much easier and safer than ever before. Work safely! Safety is everyone's responsibility, but ultimately it is in your hands. No tool by itself can guarantee your safety. It's the combination of the right tools and safe work practices that gives you maximum protection. Here are a few tips to help you in your work. Work on de-energized circuits whenever possible. Use proper lock-out/tagout procedures. If these procedures are not in place or not enforced, assume that the circuit is live. --Wear safety glasses or a faceshield. --Wear insulated gloves; remove watches or other jewelry. --Stand on an insulated mat. --Wear flame-resistant clothing, not ordinary work clothes. --Hook on the ground clip first, then make contact with the hot lead. Remove the hot lead first, the ground lead last. --Hang or rest the meter if possible. Try to avoid holding it in your hands to minimize personal exposure to the effects of transients. --Use the three-point test method, especially when checking to see whether a circuit is dead. First, test a known live circuit. Second, test the target circuit. Third, test the live circuit again. This verifies that your meter worked properly before and after the measurement. --Use the old electricians' trick of keeping one hand in your pocket. This lessens the chance of a closed circuit across your chest and through your heart. Use a meter that meets accepted safety standards for the environment in which it will be used. Use a meter with fused current inputs, and be sure to check the fuses before making current measurements. Inspect test leads for physical damage before making a measurement. Use the meter to check continuity of the test leads. Select the proper function and range for your measurement. Be certain the meter is in good operating condition. Follow all equipment safety procedures. Always disconnect the "hot" (red) test lead first. Use a meter that has overload protection on the ohms function. When measuring current without a current clamp, turn the power off before connecting into the circuit. Be aware of high-current and high-voltage situations and use the appropriate equipment, such as high-voltage probes and high-current clamps. The hazards of working with electricity aren't new, of course. But they are probably more erratic and severe. As electronic and electrical systems become more complex and as the world increasingly becomes connected through the river of electricity that courses from one application to another, the dangers of measuring its flow have increased. It's not unheard of for an electrician, for example, to find himself the victim of a transient power spike that knocks him flat before he knows it's coming, thanks to a big motor kicking on or off somewhere upline. Occasionally, a workman may end up working with lines holding significantly more juice than he realizes. It's also not unheard of for someone to work on a 12,000-volt line thinking he's on a 480 line. The task of defining new international safety standards for electrical test equipment was recently addressed by the IEC (International Electrotechnical Commission). The IEC 348 standard that was used for years to design electrical test equipment has been replaced by IEC 1010, offering a significantly higher level of safety to people working in high-voltage, high-current environments. The real issue for test equipment circuit protection is not just the maximum steady state of voltage range, but a combination of both steady state and transient overvoltage withstand capacity. Transient protection is vital. When transients ride on high-energy circuits, they tend to be more dangerous because these circuits can deliver large currents. If a transient causes an arc-over, the high current can sustain the arc, producing a plasma breakdown or explosion, which occurs when the surrounding air becomes ionized and conductive. The result is an arc blast, a disastrous event that causes more electrical injuries every year than the better-known hazard of electric shock. The most important single concept to understand about the new standard is the Overvoltage Installation Category. The new standard defines Categories I through IV, often abbreviated as CAT I, CAT II, etc. A higher CAT number refers to an electrical environment with higher power available and higher-energy transients. Within a category, a higher voltage rating denotes a higher transient withstand rating. Ranging from Category I protected low-energy circuits to Category IV installations with high-powered lines exposed to outdoor environments, the rigorous IEC international standards are designed to keep you safe. Meters designed to the new standards are more capable of withstanding the hazards caused by transients and other dangers in today's electrical systems. Any high-voltage-low-energy source derived from a high-winding resistance transformer, such as the high-voltage section of a copier. Category II conditions are most prevalent, but that shouldn't lull those testing electricity lines and sources into complacency. As soon as you move from inside a house or garage outside or into an industrial setting, chances are you're dealing with Category III or Category IV. As soon as you get into large industrial motors, you're in Category IV territory, and extra precautions should be taken when dealing with Category IV. As you can see, the concept of categories is not new and exotic. It is simply an extension of the same common-sense concepts that people who work with electricity professionally apply every day.